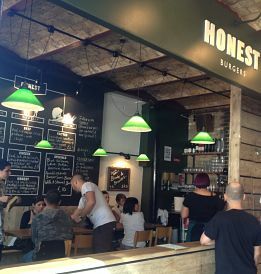 Honest Burgers – gluten free bun & chips! 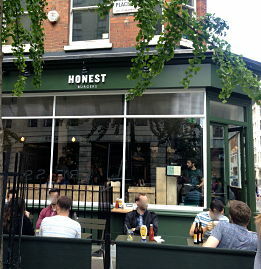 Honest Burgers is a small hamburger chain that keeps it simple and does those things well – a few different burgers with great chips and some tasty sides. It started as a small independent in Brixton Market and as luck would have it, spotted a gap in the gluten free market and has created a cult following among coeliacs in London. They now have more than 10 stores around London (central and suburbs). 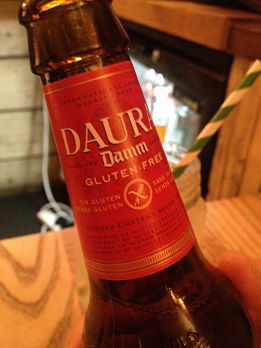 I believe this cult following all began when coeliac customers would arrive at the store in Brixton market with their gluten free buns from the nearby WagFree bakery and ask for a burger without the bun to make up their own burger. As all coeliacs know, a burger without the bun is not that inspiring and often the chips are fried with other fried items and so they are off the menu too (not here!). 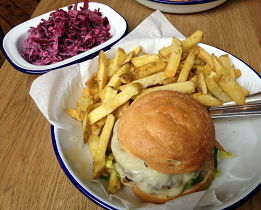 The burgers are delicious – juicy and perfectly cooked (slightly pink), and the rosemary salted chips are now legendary! The apple, beetroot and red cabbage coleslaw helps you feel you are being a tiny bit healthy while eating all the chips (down to the last crunchy morsel). The gluten free buns are by Antoinette Savill and are soft and taste as normal as you could ever get with a gluten free bun. Preparing things gluten free is their default position to make things as safe as possible for the gluten free customer and thus the relatively recent addition of onion rings are also gluten free. They do have ‘normal’ buns too, so they describe themselves as ‘gluten friendly’ rather than ‘gluten free’, but are very aware of cross contamination. I have eaten there many times and never had a problem. You can even wash it all down with a Daura Damm gluten free beer. The interiors are usually wooden tables with quirky decorations and you are served your meal in a camping style tin plate lined with paper. You can use cutlery if you like, but I think it is best as an eat with your hands meal – just watch for the juices running down your sleeve! The average cost for a burger with chips is around £10. The bill comes in an old tin which is a nice touch. Several stores are doing brunch as well as lunch and dinner – Liverpool Street, King’s Cross, Clapham, Tooting, and Peckham. You can get a fry up and a gluten free bun – for a review on brunch, please see this post by Kim McGowan. May 2016 update: Fresh juices are now available for brunch. As you can’t book, you will often find a queue out the front (particularly central London stores), but they have a great system in place where you leave your number and you can go and have a potter around the shops and they will text you about 10 minutes before your table should be ready. I wouldn’t rely on it when you are in a hurry to get to a show or an appointment, but for other times it really is worth the wait if you are craving a burger. Please see their website for location details and times (all open 7 days a week for lunch & dinner, closing between 10pm and midnight). This post was last updated June 2016. Thanks for the tip. Went to Honest Burgers today and I’m afraid the bun I was served was hard and flaky, and turned to crumbs in my throat. It was the driest burger I’ve ever had. Maybe I was unlucky, or they’ve changed their supplier, but I was charged £10.50 for a burger plus cold, dried chips. Disgusted. Hi Denis, what a shame you had a bad experience. Please let them know so they can look into it!